What is the Atmosphere of Neptune Like? The atmosphere of Neptune is similar to all the large planets in the Solar System; it mostly consists of hydrogen and helium, with trace amounts of methane, water, ammonia and other ices. But unlike the other gas planets in the Solar System, Neptune’s atmosphere has a larger proportion of the ices. It’s the methane in the planet’s upper atmosphere that give it its bright blue color. At the highest altitudes, where the Neptune’s atmosphere touches space, it consists of about 80% hydrogen and 19% helium. There’s also a trace amount of methane. The light we see from Neptune is actually the reflected light from the Sun. Although the entire spectrum of light hits Neptune. This trace amount of methane absorbs light from the red end of the spectrum, while allowing the blue light to bounce back out. The color of Neptune’s atmosphere is brighter than Uranus, which has a similar atmosphere; astronomers aren’t sure why there’s such a dramatic color difference. The upper level clouds on Neptune occur at the point where pressures are low enough for methane to condense. Astronomers have photographed these high altitude clouds forming shadows onto the lower cloud deck below. Deeper down inside Neptune, temperatures should get up to 0 C, where clouds of water might form. 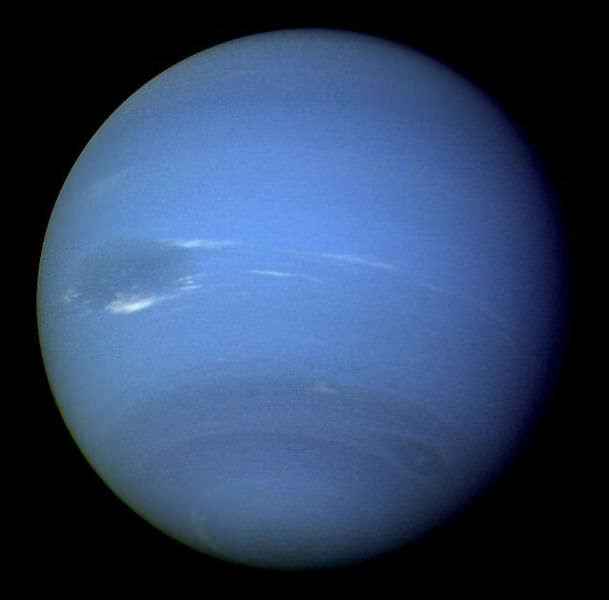 As with the other planets, the atmosphere of Neptune is broken up into distinct bands of storms. In fact, the fastest moving winds in the Solar System occur at Neptune – winds have been clocked at 2,400 km/h (1,500 miles per hour). Some storms can grow large and remain for long periods of time. Neptune has its own Great Dark Spot, similar to the Great Red Spot on Jupiter. We have written many articles on Universe Today about the atmosphere of Neptune and its storms. Here’s an article about the weather in springtime on Neptune, and how Neptune’s south pole might be the warmest place on the planet. Next PostNext What Color is Neptune?